To subscribe to this newsletter, visit the Workers' Comp Hub. Climate change and sprawling development have combined to make natural disasters an urgent national problem. In the last few months, hurricanes have devastated Texas, Puerto Rico, the Virgin Islands and Florida, and wildfires have scorched California and much of the West. These disasters don’t just turn the lives of residents upside down: the days and months after disasters pose serious health and safety threats to clean-up and reconstruction workers too. The health and safety hazards of clean-up are acute and wide-ranging. Debris from homes ravaged by storms and fires contains highly toxic silica, asbestos, and lead as well as heavy metals from electronics and household waste. In post-hurricane sites, these chemicals combine with toxic mold and contaminated floodwaters to form a deadly threat. 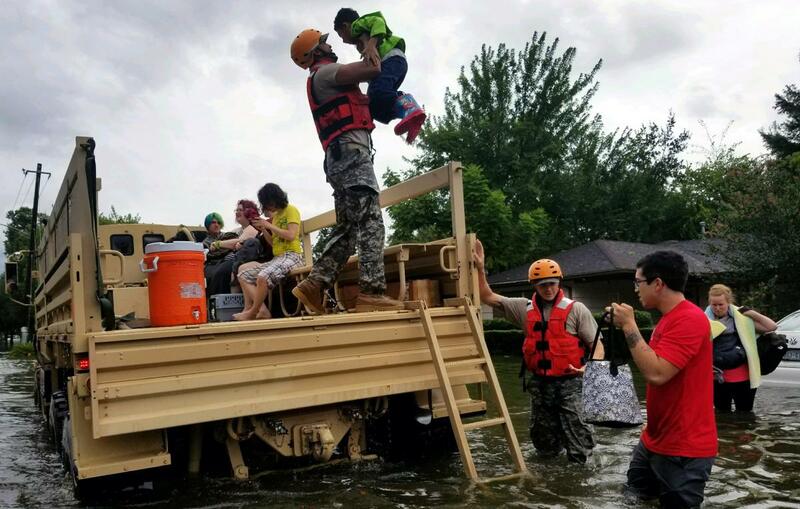 Moreover, many Harvey recovery workers face the additional dangers of working on the area’s oil refineries and chemical plants, or around 13 Superfund sites that were damaged in the storm. In the midst of such a hazardous environment, proper safety training, precautions, and equipment are often a matter of life and death. But according to Marianela Acuña Arreaza, the Executive Director of Fe y Justicia Worker Center in Houston, the urgency of post-storm work often exacerbates existing worker abuses, like not allowing sufficient breaks in conditions of intense heat and poor ventilation. OSHA has only 23 staff members in the Houston area, making it impossible to systematically regulate workplaces, even under normal circumstances. The agency relies on workers to report abuses, but “there are a lot of workers that OSHA inspectors and OSHA staff have trouble reaching, primarily immigrant workers who may not feel comfortable talking to OSHA inspectors,” says Jordan Barab, former Deputy Assistant Secretary of Labor for Occupational Safety and Health under the Obama administration. Indeed, immigrant workers, who are already in a very precarious situation under the Trump administration’s deportation policies, are at the greatest risk for health and safety violations, wage theft, and retaliatory threats in the post-disaster environment. In the wake of Hurricane Katrina and other past disasters, immigrant workers played an integral role in the recovery effort. But as workers testified to Congress in a 2007 investigation, they were taken advantage of over and over again by contractors, with no recourse to justice. A lack of employer accountability, coupled with a wider context of discriminatory sentiment and anti-immigrant policy, creates an opening for contractors willing to gain a competitive edge and maximize profit by taking advantage of immigrant workers’ vulnerable position. When clean-up workers are injured or made ill on the job, workers’ comp is hard to get. This is especially true in Texas, where, because of the state’s ‘opt-out’ laws, there is no systematic or enforced accountability for employers outside the workers’ comp system. Legally, opt-out employers can not only refuse to pay any medical fees or wage replacement for injured and ill workers, but can also threaten to fire anyone who indicates an intention to file a suit for negligence. What’s more, much of the post-disaster work in Texas and everywhere else is on residential projects, where homeowners pay contractors or day laborers directly. In this informal context, workers are not covered by workers’ comp, and those who assert their federal rights to proper health and safety conditions can be readily fired and replaced. And for undocumented workers, it often doesn’t matter whether their employers carry workers’ comp insurance: under the Trump administration’s aggressive immigration enforcement, many are reluctant to file a workers’ comp claim, fearful of any contact with government agencies. While high-ranking government officials have been conspicuously absent in monitoring and addressing recovery workers’ safety, advocacy groups have stepped up to promote safe and lawful workplace practices. “Ultimately, the lives of workers are too important for us to sit back and do nothing,” says José Garza, Executive Director of the Workers Defense Project in Texas. National COSH has been working with local advocates from Fe y Justicia Worker Center, the Chemical Workers Union, and the National Day Laborer Organizing Network to train organizers, who will in turn train day laborers and community members on safe clean-up practices, workplace health and safety rights, and how to negotiate the challenges of asserting those rights. Worker groups are also advocating for an ordinance that would restrict the city from hiring contractors who have had previous wage and hour violations. For a series of fact sheets on safe clean up and more on how to help, visit the COSH Network’s #SafeCleanUp page here. Emboldened by Trump’s aggressive deportation tactics, some employers have tried to dodge their legal responsibility to provide workers’ comp benefits by reporting undocumented injured workers to Immigration and Customs Enforcement (ICE). Florida lawmakers are reviewing a 2003 state law that has been used to deport hundreds of injured undocumented workers for filing workers’ comp claims. A ProPublic and NPR investigation found that the law, which makes it illegal to file for workers’ compensation using a false social security number, incentivizes insurance companies to report undocumented workers to law enforcement rather than paying them legally owed benefits. Worker groups have been training their communities on what to do. The National Day Labor Organizing Network has factsheets in English and Spanish explaining immigrant workers’ rights, listing resources, and offering advice on what to do if ICE raids your home or workplace. The National Employment Law Project (NELP) has published a factsheet explaining immigrant workers' rights to workers' comp and advising workers' comp lawyers on how help if retaliation occurs. Over 800,000 workers will continue to face risks of debilitating respiratory and kidney diseases from unsafe silica exposure because the Trump administration plans to backtrack on desperately needed updates to permissible limits on silica exposure. The silica rule rollback is part of a broader assault on occupational health and safety regulations, including a proposal to reject updated beryllium exposure limits for shipyard and construction workers, suspension of a rule implementing an electronic database of workplace injury and illness, and a delay on new requirements for mining safety inspections. At the same time, OSHA and MSHA face major slashes in their enforcement budgets under the House Budget proposal, which would eliminate an important worker safety training program and further impair the already strained agencies' ability to protect workers. In a big win for worker organizers in Illinois, the state’s legislature passed a badly needed law targeting unjust practices and unsafe working conditions in the temp industry. The new law — which aims to end “perma-temping,” counter racial bias in hiring, and ensure proper safety equipment and training, among other things — was championed by the Chicago Workers’ Collaborative (CWC), Warehouse Workers for Justice (WWJ), the Illinois AFL-CIO, Raise the Floor Alliance, and NESRI. Farmworker organizers from Migrant Justice celebrated a major victory when Ben & Jerry’s became the first company to sign a “Milk with Dignity” agreement, which will ensure dignified housing, fair wages, adequate time off, and safe working conditions on all Vermont farms supplying the company’s dairy. NESRI, the Coalition of Immokalee Workers and the other members of the new Worker-Driven Social Responsibility Network played a key role in working with Migrant Justice to win the agreement. Several fatal accidents in the past year have called attention to the hazardous conditions facing dairy workers across the country. With very little OSHA oversight, exemption from many labor regulations, and geographically isolated immigrant workers who are highly vulnerable to threats and harassment, the dairy industry is very dangerous, and few of its workers get workers’ comp when they’re hurt on the job. In New York, the Workers’ Compensation Board has proposed drastic cuts in compensation for injured workers with impaired limbs. The New York Workers’ Compensation Alliance is organizing against the changes. Find out more and take action here. National COSH's National Conference on Worker Safety and Health will be held December 5-7 in Baltimore. Take 30 seconds to support New York’s injured workers. "Protecting Injured Immigrant Workers from Retaliation"
This factsheet from the National Employment Law Project (NELP)details immigrant workers' rights to workers' comp and advises how workers' comp lawyers can help if retaliation occurs. This series of factsheets list resources for immigrant workers and give advice on how to respond in the case of an ICE raid. "Challenging the Business of Fear"
This report from the Raise the Floor Alliance and NESRI investigates rampant retaliation and violation of workplace safety laws in Illinois' low-wage industries. The COSH Network has assembled a list of factsheets and resources in Spanish and English on how to take proper safety precautions when working in the hazardous post-hurricane environment. A new book by Jonathan Karmel presents stories of workers needlessly injured or killed on the job, looks at the wider political and historical context of worker health and safety, and offers policy recommendations for holding employers accountable and increasing worker safety.